Now that you’ve chosen your city, chosen your neighborhood, and chosen your apartment, all the hard choices are out of the way. But the hard work is still to come. Moving is tough and requires as much foresight, planning, and organization as you can give. When you’re moving into an apartment, you’re presented with a unique set of challenges. This list will help you cope with some of those challenges on moving day and the weeks leading up to it. Create a moving binder. Use it to keep track of everything move-related — there will be a lot. This checklist, for instance, should be in the front of your binder. Start packing your first (small) box. This box will not be packed or shipped with the others, but will stay with you throughout the move. It will contain your important documents — passport, will, deed, etc. Begin gathering these documents early so you can identify any missing items. This box could also contain small valuables. Back up your files. Before you pack your computer and its peripherals, make a backup of important files and family photos on a disk or flash drive that you can carry with you (maybe in that box mentioned above) during the move. Research and gather quotes from moving companies. Or begin researching truck rental companies and their prices. Decide what to sell or donate. Sell items online or through a garage sale. Decide on a moving company. Get a written contract that includes your moving date and costs. Or, if you’re renting a truck, make your reservation. Start using the food in your freezer that can’t move with you. Your freezer should be clear about a week before the move. Take this time to dig into the back of your pantry, as well. Use it or get rid of it. Plan your new home. Get the dimensions at the new apartment, and start planning how to arrange your furniture. Care for your car. Take it into a trusted mechanic and ask what services might be needed for a long-distance drive or a move to a new climate. Contact you car insurance company to update the address on your policy. Fill any prescriptions. Ask for doctor/pharmacist recommendations in your new area, and consider obtaining copies of your medical records. Change your address. Head to the post office website. Be sure to have your mail forwarded from the old place to the new. Also update your address with your bank. Cancel or redirect scheduled deliveries and subscriptions. Pack one room per day, as much as possible. Move any leftover items (excluding furniture) to a centralized location. 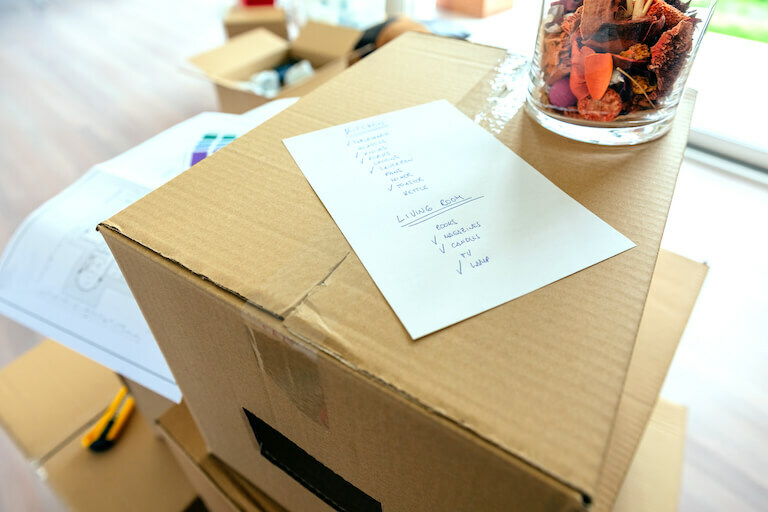 Schedule enough time to have the packing done at least 2 days before your move date. Begin cleaning empty rooms. Make sure to do a thorough clean. How well you clean can mean the difference between all, some, or none of your deposit being returned. Pack suitcases. Have one for everyone in the family to live out of for a few days as you complete packing everything in the apartment. Make sure the right truck shows up. It should have a USDOT number printed on the side that matches the number on the contract you signed. Sign the movers’ bill of lading/inventory list. Be sure to keep a copy for yourself. Tip your movers! A standard tip is $20-25. Take plenty of pictures. If there is damage anywhere, these pictures will come in handy. This is vital if you’re a renter. Change the locks. Be sure to ask your landlord’s permission. If you get it, give him or her a copy of the key. Plan your housewarming party. If you have family or friends in the area, invite them. But this is more for getting to know your neighbors than anything else.